The 54.6m Vitters sailing superyacht Adèle has completed her refit at Royal Huisman and set off on a shakedown cruise to Norway. Adèle’s winter refit programme included an overhaul of various systems, electronics and equipment as well as touch-ups and repairs to her interior and a new teak deck. 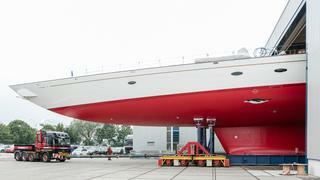 During the refit, the bright red hull was repainted and her climate control system was updated. Andre Engblom, captain of Adèle, was involved in the original build process and acted as owner's representative during the Royal Huisman refit. He explained that pre-planning for the refit began 18 months in advance. 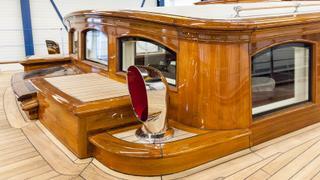 "The owners were proud to bring the boat to a yard with such a prestigious history and reputation," he added. 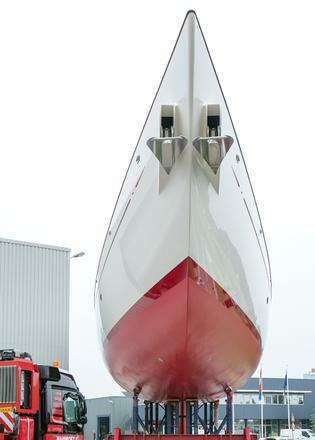 She was the first yacht to undergo work at Royal Huisman's recently extended refit hall and climate-controlled paint hall. Adèle is widely regarded as one of designer and naval architect Andre Hoek’s most beautiful sailing yachts, praised for her combination of classic J class-inspired lines with a modern rig and underbody that gives her the ability to undertake fast ocean passages. 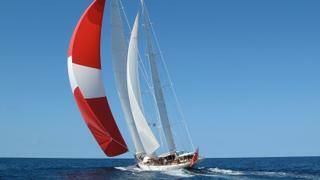 Since her launch in 2005, Adèle won an award for Best Sailing Yacht over 40 metres at the ShowBoats Design Awards in 2006 and another for Best Sailing Superyacht 51 metres and above at the World Superyacht Awards in the same year. Her previous owner Jan-Eric Österlund sailed Adèle around the world and wrote a book about the adventure. In Exploring With _Adèle_ he reveals the yacht was named after his mother, who encouraged him to explore.